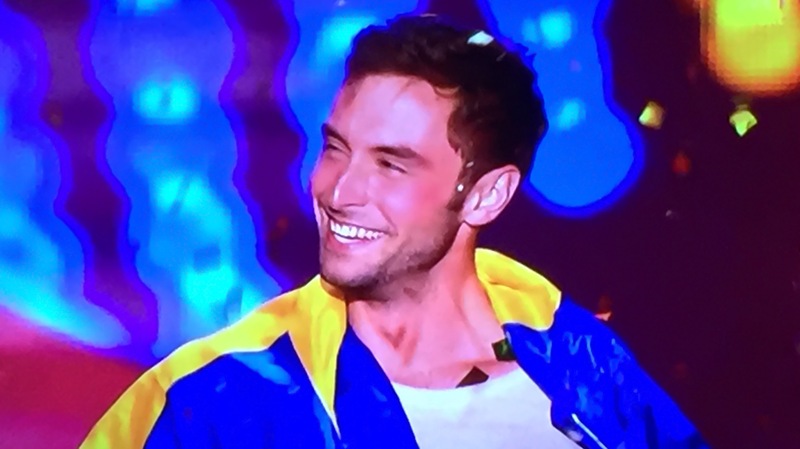 If you don’t recall my other post about Eurovision, read up here. There I explain all about how the contest works. 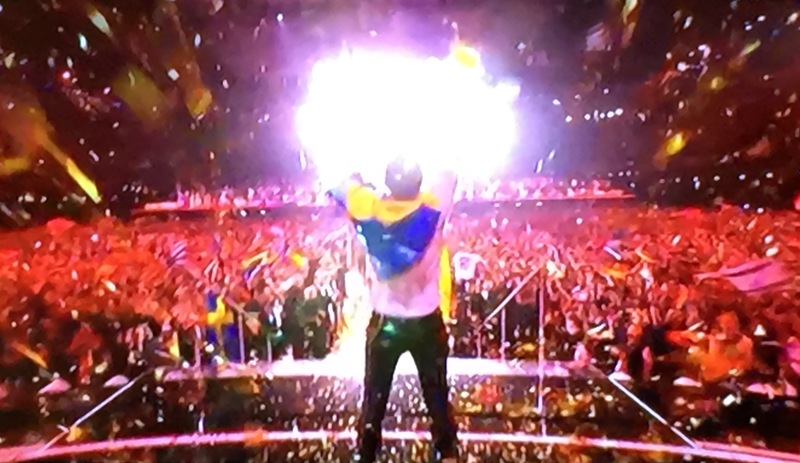 Guess what, one week ago today, Sweden did it again! 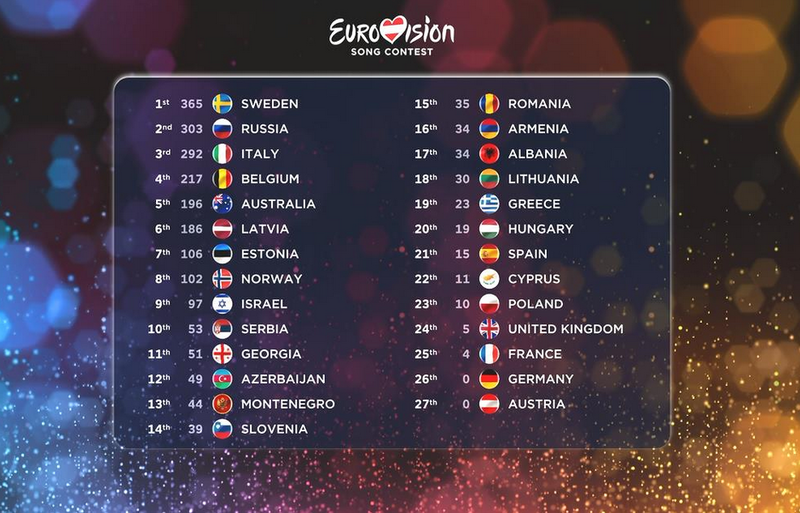 This post won’t be quite the same detailed run-down as my previous post was, but I will have you know that I personally think that this year’s Eurovision Song Contest was the best one I have ever seen. Every country that made it to the final really stepped it up. Every single song and artist was truly amazing. And I’m pretty hard to please, seeing as I’m a native English speaker I’m hard on artists. If they can’t sing in English, I’m a firm advocate for them singing in their native tongue. This year, however, no one’s English caused me to cringe or want to turn off my TV. Everyone brought their A-game. 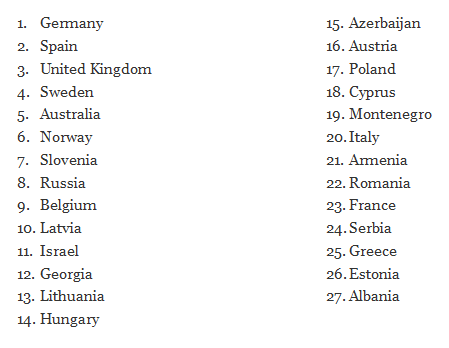 That being said, here are the results, as well as links to the songs from the official ESC site. 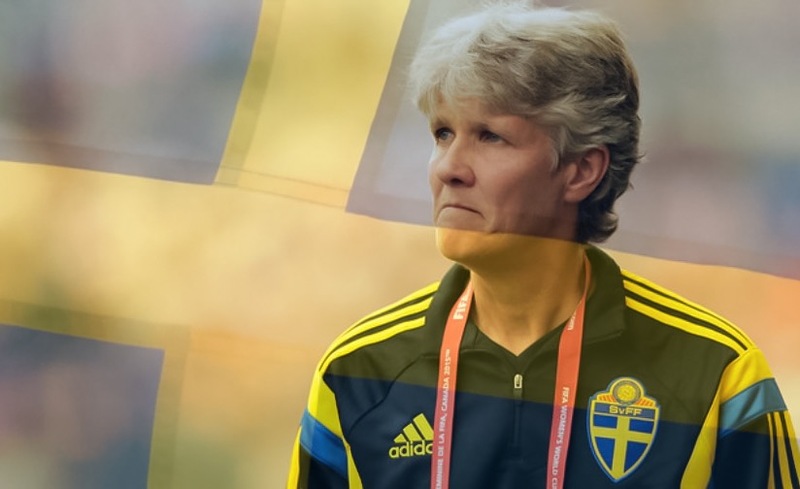 Definitely click the link to listen to Sweden’s song, and I even encourage you to click all the links. Form your own opinion. Learn a little about European music. Although I thought this year’s performances were above and beyond, as per the usual I did not agree with this year’s voting. This year’s song contest did not occur without a little drama. Half way through the contest Russia was winning. The audience did not like this, and they started booing when Russia received points. The TV hosts reminded the audience that the song contest is completely outside of politics, and all artists should be supported. 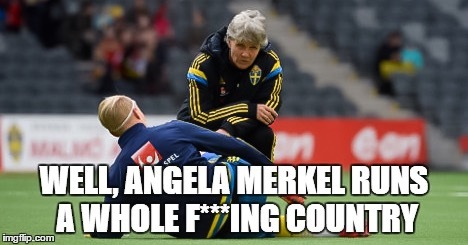 A bit later on a Sweden chant began. Little awkward, but the ESC has been very pro LGBTQ, and Russia these days is the opposite of that. So, although awkward, not unsurprising in the least. I do think that what the hosts said was important though, the music is the focus, and the music this year was GREAT. I’m super glad Sweden won, and if any of you readers can get me tickets to the song contest next spring I would be forever in your debt! Categories: Entertainment, Humor, Life | Tags: Albania, Armenia, Australia, Austria, Azerbaijan, Belgium, Cyprus, entertainment, Estonia, Eurovision, Eurovision Song Contest, France, Georgia, Germany, Greece, Hungary, Israel, Italy, Latvia, Lithuania, Montenegro, Norway, Poland, Romania, Russia, Serbia, sing, singing, Slovenia, song, Spain, Sweden, United Kingdom, win, winning | Permalink. Every hockey season spans two years. 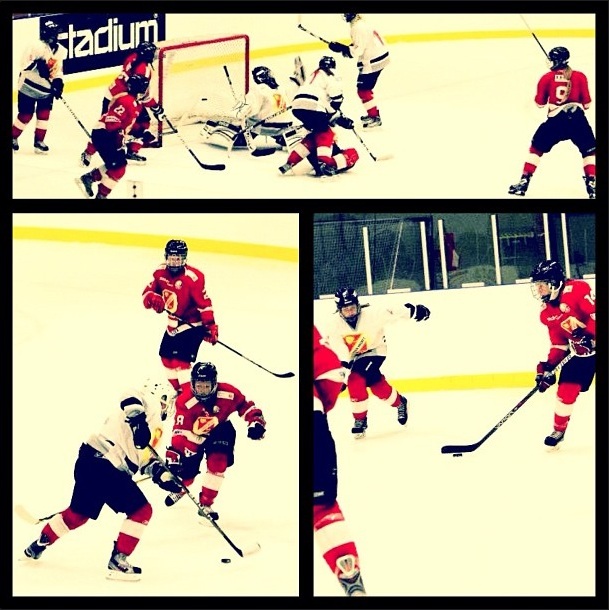 Since starting off the hockey season in September we have come a long way. The second half of the season starts tomorrow with a game in Stockholm. Back in September we had a team bonding day where we played different team bonding games. 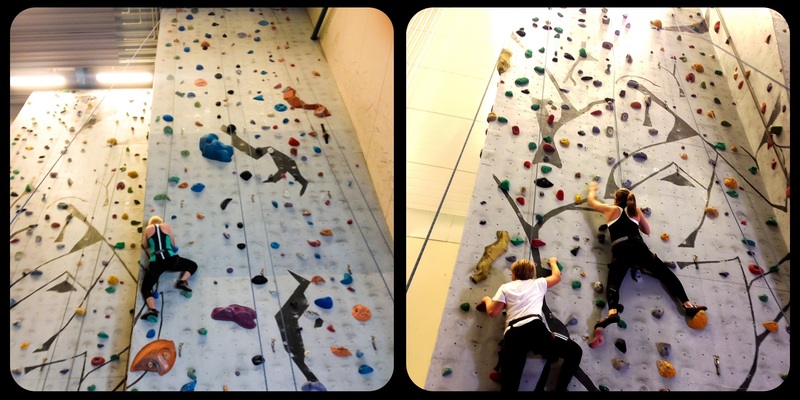 Games that involved long poles, cooking meat sauce and rock climbing. It was a great day, where lots of bonding took place. We had a few serious conversations about our goals that day. I thought it’d be fun to take a look back, now that we’re embarking on a new year and the second half of regular play. Which is why I made a word cloud, using the fancy Java found here. Before our season started up we had the following goals and ideas about what this season would look like and what it would take to get where we wanted to be. Yes this is in Swedish. For those of you less adept at the Swedish language I also made one in English. This is how we thought, felt, and expected to act at the beginning of the season. This is what we thought we would need to achieve in order to reach our goals. Side bar: I know I didn’t translate “allettan”. Let me explain. We play in Division 1 East. That entails that at the end of our season three teams from our division move on to compete in a tournament called “allettan”. Allettan is a compilation of the top teams of Division 1 across Sweden. The top two teams from the allettan tournament go on to compete with the bottom two teams in riksserien for a spot in next years riksserien (the highest women’s hockey league in Sweden). I thought it would be interesting to take a look again at what we were looking to get out of this season. How well have we lived up to these goals? It may be too soon to tell. We still have a chance at making it to allettan, but the road ahead will be a long one. We will have to work harder than we have worked thus far. I still think all of these words have a place in describing our team. I hope they still do when the season wraps up. 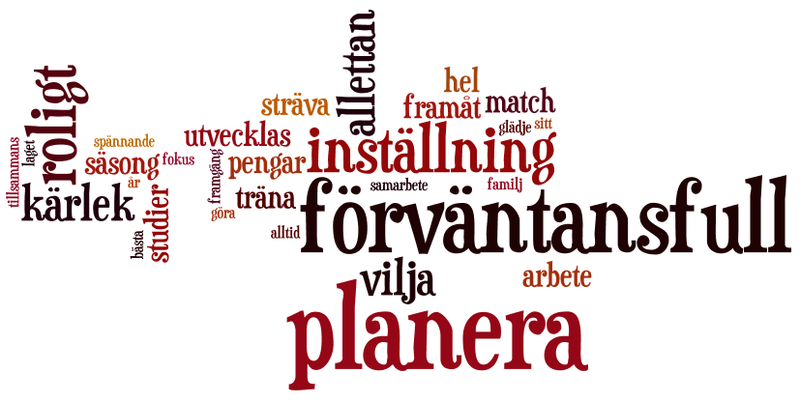 Categories: Humor, Life, Sports | Tags: '13-'14, 2013-2014, allettan, cold, compete, Division 1 East, hockey, hockey season, ice, ice rink, life, play, sport, sports, Sweden, win, winter, women's hockey, work, work hard, work outs, workout, workouts | Permalink. Time again to lace up each skate. It’s easy to get back in gear. The time is nigh, this is the date. Our team is gathered, all are near. Mean naught if we can tie the score. Knowing we can win, more and more. Team, as one, can surmount this heap. A game to play before we sleep. Regular season play begins tomorrow. Are you ready? Categories: Fitness, Health, Hockey, Life | Tags: game, hockey, ice, play, poem, ready, Robert Frost, skate, team, together, win, winning, work outs | Permalink.